Students, alumni, journalists and staff from City, University of London have gathered to celebrate the illustrious career of Professor Roy Greenslade. The journalist and media commentator, who is retiring from City, discussed his experiences from more than 50 years in newspapers at a special event. 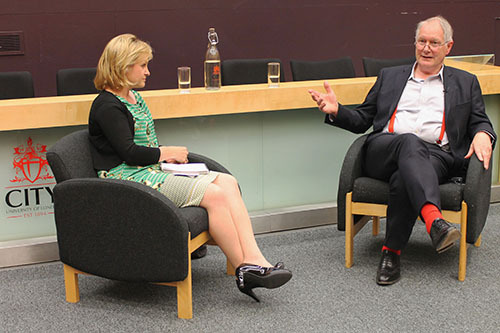 He was interviewed by the Department of Journalism’s newest member of staff, Professor Jane Martinson, who worked alongside Professor Greenslade at The Guardian and is a City alumna. Professor Greenslade explained how he entered the industry through regional journalism with a job at the Barking and Dagenham Advertiser. He then described his progression to Fleet Street and the national press, which began at The Sun with the first of several stints at the paper. His career took him to senior jobs at several national titles, including The Sunday Times, and culminated with a job as editor of the Daily Mirror. 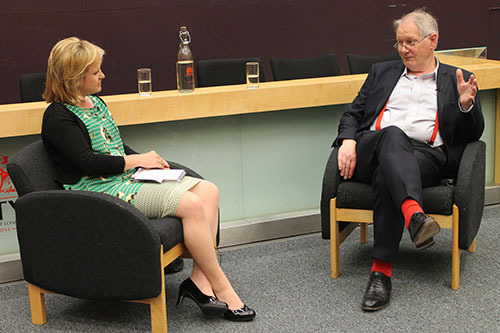 Professor Greenslade also reflected on his time working alongside many famous names, such as the owner of The Sun and The Sunday Times, Rupert Murdoch, and the then owner of the Daily Mirror, Robert Maxwell. He gave his observations on major changes in the industry, such as the reduction in the sexism that was prevalent in newsrooms when he first started, and how the number of women in journalism has gradually increased since. Concluding the talk, Professor Greenslade gave his views on the future of journalism, including his take on the ongoing decline in print newspaper sales and the challenges of funding online journalism. Professor Greenslade is retiring from City after 15 years at the university. Professor Martinson, the former media and women’s editor at The Guardian, joined City as Marjorie Deane Professor of Financial Journalism in April 2018.